"The perfect architectural symbol for an era obsessed with customisation and participation"
Opinion: a Le Corbusier design for a customisable house inspired by the devastation of Flanders during the First World War has haunted architecture ever since, says Justin McGuirk. Any major anniversary carries with it a baggage of minor ones, and so it is in 2014. When Europe marks the 100th anniversary of the start of the First World War later this year, few people will be thinking about architecture. And yet it was the devastation of Flanders in the autumn of 1914 that inspired Le Corbusier to design the Maison Dom-ino, a standardised construction system for the reconstruction effort that was to come. That simple drawing has haunted architecture for a century. Indeed, it is far more relevant today than it was then. The Architectural Association in London kicked off the commemorations last week with The Dom-ino Effect, a symposium dedicated to Corb's idea. Fill a room with Le Corbusier scholars and the proceedings will tend towards the arcane, but I stuck with them, not just because I was presenting at the end of the day but because of what the Dom-ino represents: perhaps the first case in architectural history of a house designed as an open system, a "platform" – to use some Silicon Valley jargon – for residents to complete as they see fit. Le Corbusier was just 27 when he conceived of the Dom-ino – so called because the houses could be joined end to end like dominos, and hyphenated to combine "domus" and "innovation". By November 1914, one fifth of the Belgian population was homeless. Corb's solution was almost painfully simple: a standardised, two-storey house made up of concrete slabs supported on columns and a staircase. That was it – no walls, no rooms, just a skeleton. He hoped to patent the idea and make his fortune in partnership with his friend Max Du Bois' concrete firm. This would be a housing assembly line, like the one Henry Ford had invented only the year before. But it wasn’t to be. Failing to find any backers, he was forced to abandon the idea. More than one speaker last week pointed out that the Dom-ino model doesn't actually work. First of all, the columns are too slender to support those slabs, and secondly, the placement of the staircase prevents the houses being joined end to end as the name implies. Moreover, Corb's vision for the resulting houses was far from radical: traditional bourgeois facades concealing conventional bourgeois layouts. And yet, if you take his drawing at face value, as pure structure, it was a phenomenally bold idea. So bold, that no one recognised it, not even, at first, Corb himself. Today, we are only too aware that most homes on the planet are built without architects. Go to the suburbs of Cairo, and you’ll find they are made up of thousands of medium-rise concrete frames, filled in with terracotta blocks. As Pier Vittorio Aureli, the symposium's organiser, put it, "the Dom-ino has become an ever-present ghost in the contemporary city – it seems to be everywhere." If only his patrons had known that one day millions of houses would be built along similar lines, not just in Europe but in the slums of the developing world. The London-based architect Platon Issaias argued that most of Athens is made up of Dom-ino houses. After the Second World War, the Greek government stoked the recovery by allowing families to sell plots of land to developers for a share of the resulting buildings. The polykatoikia, a multi-storey apartment block, is effectively a tall Dom-ino, built without an architect, in which every family has configured their own apartments. The model was so successful that it created a vast class of landowners – and, of course, debtors. What is radical about Dom-ino is that it is merely the beginning of a process, one completed by residents themselves. It is, in other words, the abandonment of total design. The architect is no longer a visionary, just a facilitator. That very idea was taken up by Stewart Brand in the 1990s in his book and subsequent BBC series How Buildings Learn. Better known as the founder of the Whole Earth Catalog and one of the original Californian techno-utopians, Brand took on architecture and argued that buildings work best when they evolve gradually and incrementally. As a critique of architecture it was not particularly potent, and yet, characteristically, he was ahead of the curve. 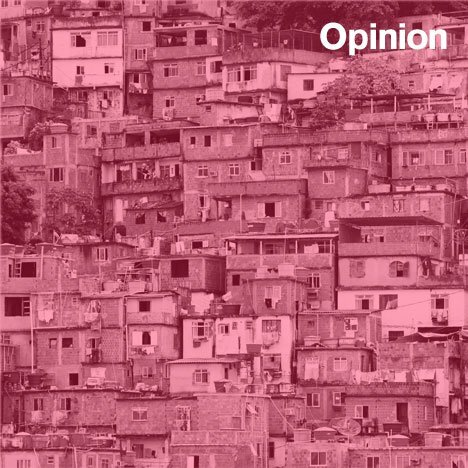 Today, architects as diverse as Santiago’s Alejandro Aravena and London's 00, designers of the Wikihouse, argue that what we need are self-empowering systems not finished houses. "All buildings are predictions," wrote Brand. "All predictions are wrong." That is certainly true of Torre David, the 45-storey skyscraper in Caracas that was meant to be a financial headquarters but is now home to 3,000 squatters. The Torre, I have argued, picking up on an idea posited by the architects Urban-Think Tank, is a Dom-ino house extrapolated into a skyscraper – essentially a concrete framework, inhabited and transformed by an unexpected population. It is the Dom-ino on an urban scale, with its own retail and sports facilities, with corridors as streets. Life there is precarious, and yet the residents have something very few of us do: the right to determine the terms of their own existence. As the Dom-ino was born out of crisis, so it seems to remain associated with it. Thus far, it sounds like the product of scarcity, the solution to a global housing deficit. And yet it has echoes in "high" architecture too. As Maria Giudici pointed out, OMA's unbuilt design for the Jussieu Library, with its skeletal, open framework, is reminiscent of it. Even more strikingly, look at SANAA's Rolex Learning Centre, a fluid landscape of nothing but floor, ceiling and columns. The rhetoric behind this building was one of chance encounters and the sharing of ideas, it was the language of social media. And this is where Corb's drawing comes into its own, as a platform, in every sense of the word. Ironically, Corb had Fordist standardisation in mind and yet produced the perfect architectural symbol for an era obsessed with customisation and participation. Stripped of architecture, the Dom-ino is pure system. It invites us to complete it and inhabit it in any way we desire. More than the specific system itself, it is that idea that is so relevant today. By the same token, the drawing is so open that we can read what we choose into it. Image of Favela, a crowded Brazilian slum in Rio de Janeiro, courtesy of Shutterstock. Justin McGuirk is a writer, critic and curator based in London. He is the director of Strelka Press, the publishing arm of the Strelka Institute in Moscow. He has been the design columnist for The Guardian, the editor of Icon magazine and the design consultant to Domus. In 2012 he was awarded the Golden Lion at the Venice Biennale of Architecture for an exhibition he curated with Urban Think Tank.